The "set of all sets that do not contain themselves" is the basis of Russell's Paradox, which dealt a devastating blow to the projects of Russell and Frege in grounding all of mathematics in pure logic. 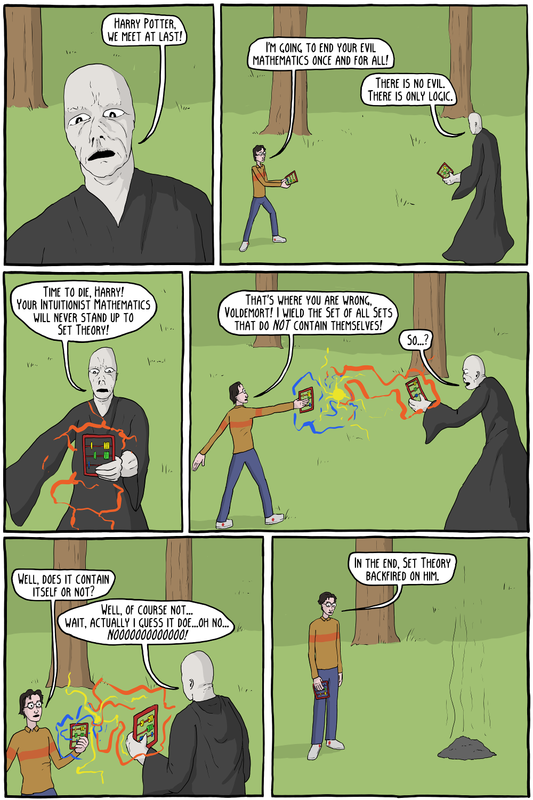 Voldemort is roughly representing Frege, who was devastated upon hearing from Russell about the discovery of the paradox, as it destroyed much of his work in Grundgesetze der Arithmetik, where he was attempting to ground arithmetic in logic. Apparently he even had to run to the presses, asking them to stop, but in the end agreed with the publisher to put an addendum admitting to the paradox. 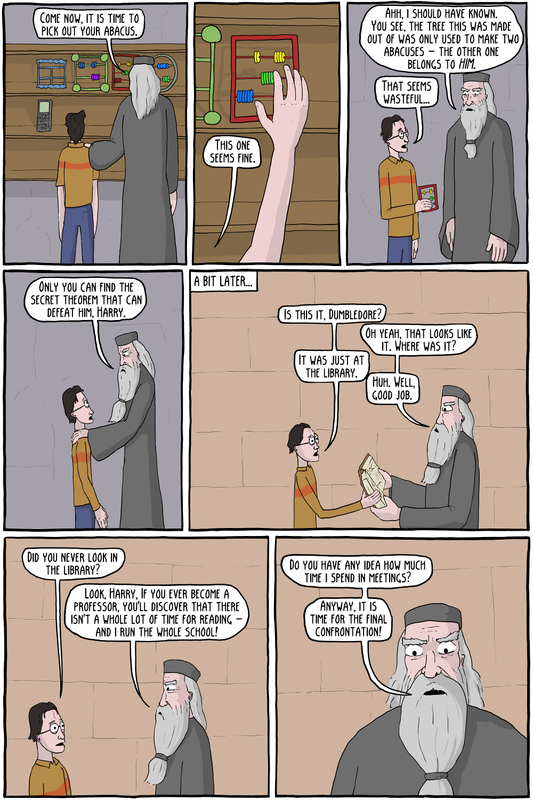 Harry Potter and Dumbledore represent, roughly, Poincaré and Brouwer and other Mathematical Intuitionists. This is the view that mathematics is merely a creation of the mind, it opposes the Logicism of Frege and Russell, and the Platonism of people like Gödel. Poincaré strongly opposed Set Theory, believing any mathematics had to be thrown out that was impredicative. Unlike many of the mathematicians working at the time, Poincaré was quite happy about Russell's paradox, because he thought that it dealt a final blow to the logicism of his opponents. 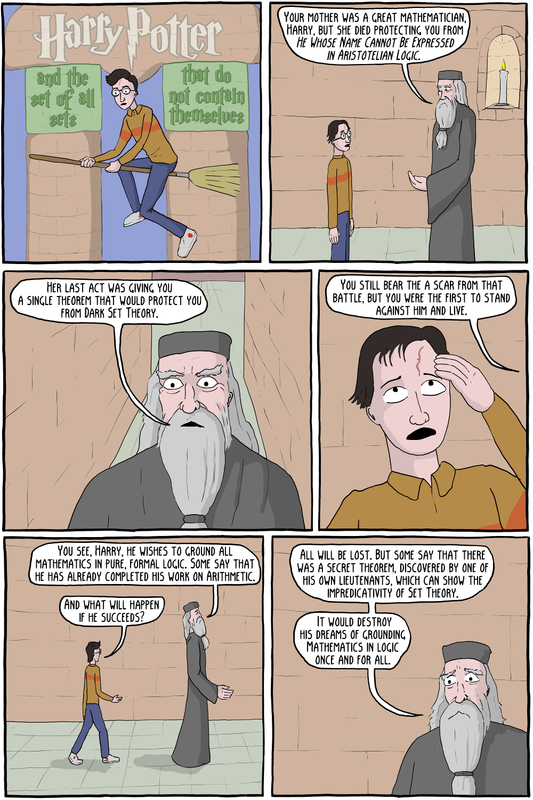 If you are interested in philosophy of Mathematics, Bertrand Russell, and comics, then I can't recommended Logicomix enough, it was extremely well done, even if they took some liberties with the story for a better narrative (which I think is entirely fine to do).